Sassoon was born September 8, 1886 in Brenchley, Kent, England, and died September 1, 1967, in Heytesbury, Wiltshire, England. He enlisted in World War I and was twice wounded seriously while serving as an officer in France. 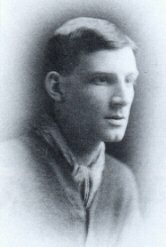 He became widely known for his antiwar poetry, such as The Old Huntsman (1917) and Counterattack (1918), and his public affirmation of pacifism, after he had won the Military Cross and while he was still in the army. His antiwar protests were at first attributed to shell shock, and he was confined for a time in a sanatorium, where he met and influenced another pacifist soldier-poet, Wilfred Owen, whose works he published after Owen was killed at the front. His autobiographical works include The Memoirs of George Sherston, 3 vol. (1928–36), and Siegfried's Journey, 3 vol. (1945), and more of his poems were published as Collected Poems (1947) and The Path to Peace (1960). His later poetry was increasingly devotional. The Owen-Sassoon story is portrayed in a moving and informative documentary about their time together written for television by the BBC called Regeneration. See more about Regeneration at the BBC site: click here. For more about Wilfred Owen and other figures prominent in war poetry and prose, visit the poetry and prose section of FirstWorldWar.com, a web site covering many aspects of that war. Visit the First World War web site: click here. See ETAF's recommendations: click here.